Eric Ries defines a startup as “a human institution designed to create a product or service under conditions of extreme uncertainty.” Well, between Brexit and the Trump administration, to name two biggies, you don’t get more uncertain conditions than our current global political climate. Let’s come together with innovative practitioners across industries (such as fintech, cleantech, Lean Impact, Lean enterprise) and discuss how we go from feeling immobile and ill-prepared for these massive changes to moving forward from a position of strength using proven strategies such as Lean Startup. Let’s leave all the tech jargon and theoretical conference talk behind and really dig into the practical ways our organizations can continuously adapt and innovate for the long term through techniques validated in environments of extreme uncertainty—such as Lean UX, Lean Governance, and Lean Scale-Up. We’ll share the real stories of our successes and failures in these areas. Join us during London Tech Week for Lean Startup Summit London, an important global conference on creating stable pathways forward in uncertain times. On June 13-14, we’ll gather at the London Stock Exchange and Here East to bring together startup ecosystems, enterprise innovators, and Lean Startup coaches from around the world to network and share strategies that help us all navigate these choppy political and economic waters with greater confidence. Attendees of the London Summit get an extra bonus: a special pre-publication edition Eric Ries’ latest book, "The Startup Way," which focuses on the implementation of Lean Startup techniques inside large companies. The book won’t be available to the public until October, but London attendees will receive a special early conference edition of the uncorrected paperback proof, being printed especially for you this summer! Attendees will also receive the hardcover book in the fall. A Gold Pass entitles you to an afternoon of interactive Lean Startup workshops with Lean Startup Co. Teaching Faculty Member Phil Dillard, Strategyzer’s Alexander Osterwalder, and Spinnaker’s Sonja Kresojevic as well as networking at a special VIP happy hour at the London Stock Exchange on June 13, as well as entrance into the main conference at Here East on June 14. A Silver Pass entitles you to the day-long conference of keynote talks, interactive breakout sessions, and networking at Here East on June 14. The workshop day will be held at London Stock Exchange, while our Main Conference Day will be held at Here East. 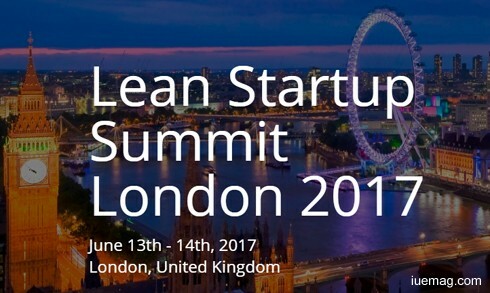 The iUeMagazine team is delighted to work with the Lean Startup Summit London 2017 as Online Media Partners & is expected to bring Unlimited Inspiration for all readers from the proceedings of this event. Staying tuned to the enriching updates from this event is recommended.